I sensed this day was going to be different for me very early. I live in Newcastle and had to commute to Sydney. As there was a group of us, a bus was hired with a driver. Leaving home to connect with the bus there were huge electrical storms rolling in which soon engulfed me in a huge downpour. The downpour soon solidified into hail to cause real havoc. The crescendo of hail stones hammering into my car had me in the mood to rock! I am sure you are not here to read about my day so on to the gig. 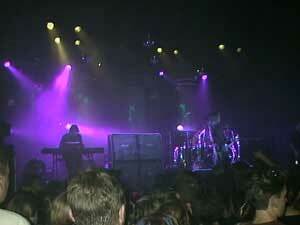 We arrived at the Enmore Theatre after 8 p.m. Gerling, the support band, were nearing the end of their performance. The venue was packed with hundreds more on the footpath that couldn't get in. 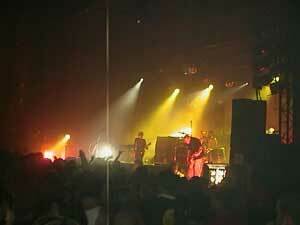 The venue had thousands more ticketing enquiries after the gig had sold out. With the 'chair due on at 9pm we hustled in to take position for what was sure to be a show to rock the house. 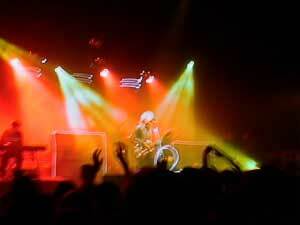 Reading back on a previous gig review by Pete Walton (New York, Feb. 16, 1999) he said "During the band's show at New York's cozy Bowery Ballroom, silverchair did the unexpected, and did something that many bands today seem reluctant to do: they rocked." That very well sums up the "new" silverchair. Not that they haven't rocked in the past, simply put their performances now are incredibly tight, well orchestrated, passionate rock explosions. I have seen no band like them. The talent silverchair has is awesome and it comes beaming through with their incredible new album Neon Ballroom. 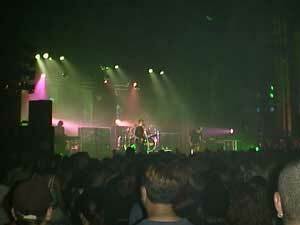 silverchair played much the same set list as in previous gigs described by chairpage reviewers. They burst onto stage with the haunting "Emotion Sickness" which was overwhelmingly received by the enthusiastic crowd. Later in the performance came new songs "Ana's Song", "Miss You Love", "Paint Pastel Princess" and the stirring "Anthem for the Year 2000". The highlight for me was "Ana's Song". A classic that I have no doubt will be a smash hit. It bought the crowd to raptures. "Miss You Love" is I think a song equally as good. 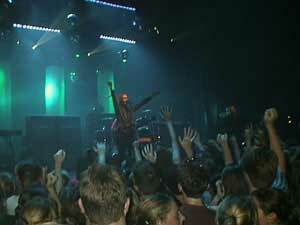 The new songs were separated by most of the favourites off previous albums including Daniel performing "Tomorrow" solo. I missed that on the Sonic.net live Internet transmission of the New York gig so the performance was another of the many highlights for me. silverchair topped off their amazing rock explosion with an encore of "Spawn" that left this reviewer shaking his head in awe. After a while the lights came on and the appreciative crowd quickly dispersed into the very hot and humid night. We tried to be at the venue as early as possible, and ended up arriving a few hours before hand. Thankfully this was enough to reward us with first in line. I knew it was going to be a very "teenie bopper" night - but tried to ignore that and have a rocking good night. Gerling kicked off the show at about 8:15 (45 minutes late) with the only song i knew 'death to the apple girls' - then played some synth stuff aswell. It turned out the guitarist went to my school. Anyway, chair finally graced the stage at approx. 9:30pm... I may be wrong though cuz I didn't have a watch on. The Neon piping around the amps and rum kit "added" to the almot ritualistic "theme" effect silverchair are renound for having on tours (Freak Show had the circus music and backdrop, etc). 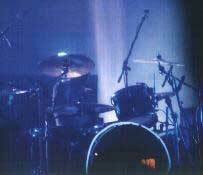 Once the neon lit up, the crowd got a sudden burst of energy and were pumping until the backing tape played and the strobe behind Ben's kit flickered. I was a little suprised at the set list. They kicked off with Emotion Sickness - which went down very well (they were rehearsing before the gig), although you could see how nervous Daniel was (it's okay Daniel, I understand;). After Emotion Sickness finished, my first suprise of the night was Israel's Son beind played second. It was played abit "slower" than they would have previously played it live, and with a little less distortion I felt, it still went down very well. I'm putting down the tempo reduction to "suiting" the new album genre. I'm a bit vague on the exact set list (the girl next to me got it), but the folowing songs included Abuse Me, Anas Song (Open Fire), Miss You Love and Paint Pastel Princess, Madman, Suicidal Dream, Pure Massacre and Freak. Forgive me if I have missed some. I feel the new songs went down really well, not many people knew all the words (although I certainly did;) - but the crowd still got into it well. Daniel played the first half of the set quite mellow - which was cool, bands need to evolve as silverchair have done. They made up for it in the second half, after giving a very powerful announcement to the crowd that from now on it will just be ROCK, and nothing else. Then they belted out The Door - which was another surprise to me, I thought they may have left this one out. Daniel played Tomorrow solo, which is what I expected as he had played it solo previously. The song came across really well, alot better than I thought (but as die-hard chair fans would know, you can never underestimate silverchair). I was slightly disappointed that No Association never made the set list, but it was a small price for such an awesome night. 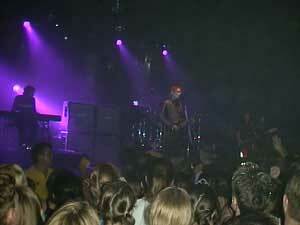 The crowd were pumping when the tell tale "feed back" sound kicked in, we knew what we were about to hear. Daniel repeated "We are the youth!" quite a few times at the beginning of the song, this may be him acting out his dream about the P.A. system blowing up. I think this was the theme song for the night, the crowed really wanted this song. Chair then finished the set up with Spawn Again - which I would have to say, rocked very hard. Enough said. We hung around the back of the theatre after wards to see if they would come out the back way. Daniel eventually came out but was quickly ushered away by John Watson (and some other people in the car). Again, if it wasn't for the screaming 14/15 year old girls, we may have had a chance to actually say 'hi.' They didn't even have any respect for the elderly lady in the car (Daniel's grandmother? ).